What is a visual rehabilitation programme? Visual rehabilitation aims to provide those with a visual disability with strategies to carry out their everyday tasks at in terms of work, education, culture and leisure, enhancing their social integration and personal autonomy. A visual rehabilitation programme consists of a series of visual exercises aimed at teaching patients how to effectively use the aids and improve their visual skills. These instruments allow patients to take advantage of their residual sight, improving their everyday skills and therefore enhancing their quality of life. Patients need to learn different skills to master their visual aid: placement, focus, detection, skimming and scanning. We place most emphasis on the aspects of skimming and scanning or tracking. A good training programme lays the foundations for the satisfactory use of residual sight with the help of optical aids, ensuring that patients do not give up using their devices should they encounter any difficulty. Training must be based on the specific requirements of each person and not only on those expressed by the family or those assumed by the optometrist, and training must therefore be individualised. The aims of specific low vision training must be established taking into account each patient's characteristics: age, cause and degree of disability, intelligence, motivation, profession. 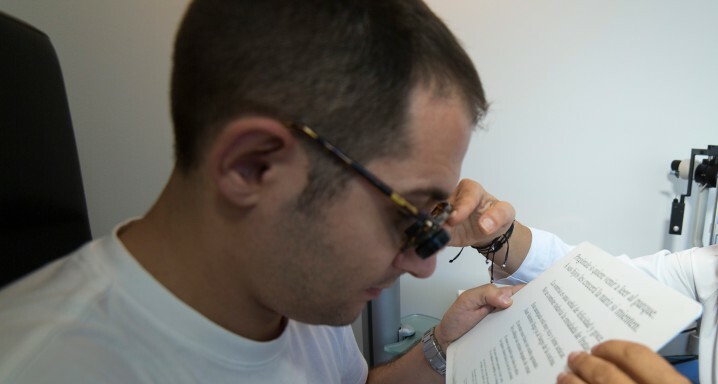 The starting point for training or rehabilitation consists of the patient realising the potential of their residual sight, the functional repercussions of their pathology and how to optimise their sight with the help of optical aids.